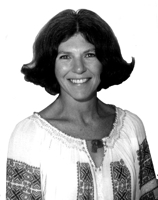 Information: Frances Lober "Sunni" Bloland, teacher and author of material about Romanian dance. Sunni received the University of California at Berkeley Distinguished Teaching Award in 1990. In 1998, Sunni received the California Dance Educators Association (CDEA) Heritage Award for life service and dedication to dance. During her more than thirty years at Berkeley, she says she "learned a great deal about teaching, both in classes and in extracurricular activities co-sponsored with students: dance clubs, workshops, the Bicentennial Celebration, and Dance Showcases." Along with her training as a dancer, Sunni brings to folk dancing her enthusiasm for dance and music, a commitment to humor, and a belief in the power of dance to transform students into happier, more confident, more cultivated, more alive and sensitive people. Sunni's focus as a teacher has always been to know her students and recognize their worth. She empathizes with the obstacles that block their fullest development: uncertainty, shyness, frustration, confusion, and the stress of competition. As an interpreter of various folk dance styles, Sunni talks about the historical and cultural context in which each dance developed to help students connect to the heritage of dance, to each other, and to their other cultural roots. Sunni also teaches hatha yoga classes in which her exuberant social-dance personality is transformed into a quieter, more serene identity that guides her students work carefully toward flexibility of the body, quieting of the mind, and letting go of stress through breathing and relaxation. Sunni has taught at major camps in the United States, including Holiday Camp, Santa Barbara Folk Dance Conference, and Stockton Folk Dance Camp in California. "Sunni Bloland," Schiffman, Jean. In Dance Teacher Now (Raleigh, N.C.), 17:3 (Mar. 1995), p.46-7,49-50,52, Illustrated. "An Evaluation Device in Dance." M.S. problem, University of Wisconsin, 1952. "International Council of Traditional Music." AMIN, Mar/Apr 1995, International Folk Culture Center (IFCC). Romanian Traditional Dance: A contextual and structural approach; American-Romanian Academy of Arts and Sciences Vol. 14. Bloland, Sunni, and Giurchescu, Anca. Mill Valley, Cal. : Wild Flower Press, 1995. Lots of great photos and background information, and a huge bibliography. Noroc-1 (LP) Hai la joc! Romanian Folk Dances, Vol. 1.  Balta, Alunelul batut, Trei păzește de la bistret, Hora de la buciu, Tropca, Sîrba la doi, Ungurica, Hora de la risipiți, Brîul lui iova. Barbatesc din ieud I, Rustemul sucit, Bătuta de la mironu, Sîrba de la tismana, Barbatesc din ieud II, Avrameanca, Hora mare bucovineasca, Galaonul de la sapata, Frunza, Mîndrele, Învîrtita de re mureș. Noroc 6-68 (7"EP)  Romanian Folk Dances Plus Two. Noroc NA 1054 (7"EP)  Romanian Folk Dances. Alunelul, Trei păzește, Hora boereasca, Brîl pe opt. Hora Ploii, Baltareasca, Ampuieții, Balta, Cărligul. The music was recorded in Cerna, is played by the village's local musicians. Noroc NA 1074 (7"EP)  Romanian Folk Dances: Hora pe Gheața, Șobolanul, Trei Păazește de la Goicea Mare. Brîul de la Făgăraș, Dansul Fetelor de la Crihalma. Noroc-2708 (7")  Romanian Folk Dances. Învîrtita din Luna-Turda, Fecioreasca. Noroc ELP-13 (7"EP)  Romanian Folk Dances. Bătuta de la Tudora, Brîul din Feneș. Roemeense Volksdansen (LP) Nevo 12153.